The Girl with the Curly Hair looks back to when she was at secondary school. The 12-16-year-old age range was one of the most terrifying and isolating phases in her whole life. She felt so different from everyone and had lots of very scary thoughts and feelings. 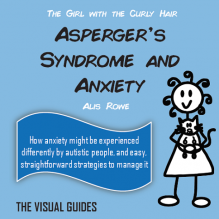 The Girl with the Curly Hair hopes that teenage autistic girls who read this book will feel much less alone. This is a great book illustrating the various difficulties of those with Asperger’s. Ideal for all members of the family, we found this book helpful in involving grandparents, parents, siblings and children in active discussions, and helping to break the taboos that previous lack of understanding had caused. Written in simple language, with great graphics, this is an easy to digest yet informative resource, and I’d say it’s essential for anyone needing to know more about AS. Until reading this, together, as a family, we had struggled to put into words what exactly needed to be said. This book is a fantastic start in overcoming that obstacle. I bought this book as a fellow Aspie to see if I could understand myself more as a teenager and for research for future fiction writing. Having read this, I now know why I was so overwhelmed at secondary school, why I didn’t like taking part in PE and drama. It wasn’t the dread of taking part, but the dread of taking part in a group activity. So, thank you, Alis, for helping me understand my teen years at school more. This is a fantastic book, I purchased it for my daughter who has a Autism diagnosis, but when she was diagnosed they said that they do not diagnose Asperger’s anymore only high level Autism. We sat down and read through the book together and my son aged 11 also with Autism came and joined us. This is an easy read with some great points about how they feel and why, most of which mine could both relate to. The main thing that stood out for me was regarding social situations and how hard it is for them to cope, especially for long periods of time. I had already accepted that they find social situations hard but did not know why. I will be lending this book to other family members. The book is imaged based with lots of colour, which made it an easy read, but had lots of information and explanation about feelings. I loved this book, layout and style as it is great for visual learners which most Aspies are. It is a great way of explaining to people what it feels like to have Aspergers and would be great for teachers to read. My only complaint is the price as I read it cover to cover in about 10 minutes, hence me questioning why it is so expensive and as a result I will probably not buy her other books which I would do if they were more reasonably priced. 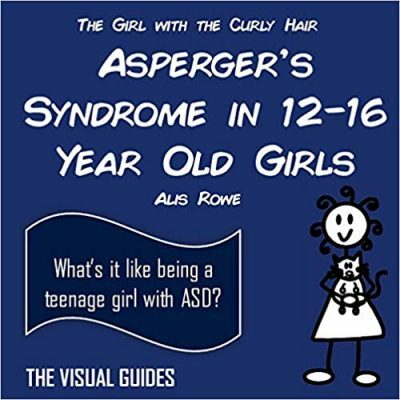 I bought and read her book “The girl with the curly hair, Aspergers and me”, which I thought was brilliant and well worth the money as there was soooo much more to read than this very short book. Apart from the price, I can’t fault it though. I’ve read four Book by Alis Rowe and this is my favourite of them all. When I was reading it, I kept stopping on a page and shouting out “yes, that’s just like my daughter”. Brilliant book and very helpful. Wow- if you have a teenager with ASD or think they may have ASD, this is essential reading! I have bought and read 5 of The CHP books, and never been disappointed. This is again, brilliant. Alis describes all aspects of the early teenage years for an ASD child, down to a T – beautifully and brilliantly and with such insight and accurate description. I could have substituted my daughters name with that on the top of the page, it is so accurate. Thank you Alis – can’t wait for the next instalment! My teenage years are thankfully behind me, but as a female with Asperger’s Syndrome, reading this book even in retrospect helped me make sense of the very hard time I had during that stage of my life. I always felt as though my peculiar responses and reactions to everyday situations were ‘wrong’ just because they were different from those of most of my peers, and I felt that there must be something the matter with me because I found situations that others seemed to find so easy so very difficult. The Girl With The Curly Hair does a fantastic job of picking out, illustrating, and explaining clearly some of the challenges that teenage girls with AS may deal with every day. I would recommend that everyone read this, be that girls with AS looking to see that they are not at all alone, or their friends and family for deeper insight into and understanding of their loved one’s experience of the world and how they can help her to make her way through these difficult years of life. Brilliant. I bought this book this week. I read it nodding and saying ‘that’s my daughter’. I’ve never found or read anything that was ‘her’ but this book is so brilliant. 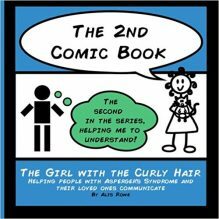 My 13 year old had a lot of difficulty in accepting her diagnosis, but this book and other Girl with the curly hair books have really helped her understand herself. She’s very keen to share pages with us and says, look at this – that’s me. It opens up pathways to understanding for both her and us. The clear diagrams and cartoons are just a perfect way to help her communicate and accept herself. Thanks Alis. As a Mum with a almost teenager girl with SPD (Semantic Pragmatic Language Disorder) and what doctors call ‘tics’ (I think Aspergers!) reading this book has been the best thing as I am recognising a lot of what my girl is doing now. I will buy a paperback for her, so she can read it and show it to other people to help them understand her. This book was very good in explaining what life is like for a teenager with Aspergers. It also helped my daughter understand herself better. It is very very pricey for the minimal content though. A little insight into the teen who struggles just a little bit more with adolescent life and social situations. Alis knits together the emotional impact of being a teen (with Aspergers) succinctly and precisely and this book could easily support someone who hasn’t yet identified how and why they just don’t seem to fit in. Helpful. Fantastic book, I have a 13 year old daughter with ASD. The book is very readable and gives a real insight into teenage girls with ASD. Reading Alis’ books have been a real inspiration to my daughter and have helped us greatly as a family.